T09 Roby is the mobile stairclimber that delivers unbeatable comfort and safety. Roby gives wheelchair users the chance to overcome architectural barriers, whether indoors or outdoors, that obstruct mobility. Designed and built to climb straight staircases and square or rectangular landings in total safety. The special track design achieves a high level of grip without leaving marks on the stairs or landings. The Roby is a market leader and a great choice for any distributor looking to supply their customers with avant-garde solutions. The Roby is powered by an irreversible electronically controlled geared motor (tratogetonic). Safe and easy use for both passenger and operator. The features available on the Roby are all aimed at improving the experience of the operators and passengers. They ensure stability and fluid movement whilst travelling both up and down the stairs. They also provide greater maneuverability whentravelling on level. - it can be dismantled in two manageable pieces; this makes the Roby easier to transport and store. - a control panel on the adjustable steering bar that includes a battery charge gauge, gradient indicator, emergency stop button, activation key. - great stability during use. The total electronic management system reduces mechanical component wear and tear. This increases the product reliability and drastically reduces the chance of component failure. This system also manages battery charge to ensure charging instructions are followed. The system will not allow the battery charge to drop below a certain level. When the battery charge reaches its minimum level, the Roby will provide only enough power to reach the next available level surface. This avoids total discharge, ensuring maximum performance and longevity of the battery. The Roby includes a manual descent system in compliance with current european regulations. This system allows passengers to be securely transported either up or down stairs to safety. Roby’s design is modern, pleasing and is made of totally recyclable materials. Steering wheel in aluminium oval profile. Control panel and casing in ABS. Belts in non-slip rubber. Headrest and grips in cleansable material. The smooth lines with no sharp edges or corners can be cleaned in just a few minutes. With this version it is possible to load most wheelchairs with 26-inch rear wheels (code ISO 12.21.06.039) seat width from 39 to 52 cm. Small Wheels Housing With steering bar specifically created for transporting all wheelchairs with small rear wheels 12-inches (code ISO 12.21.06.045) seat width from 39 to 52 cm. 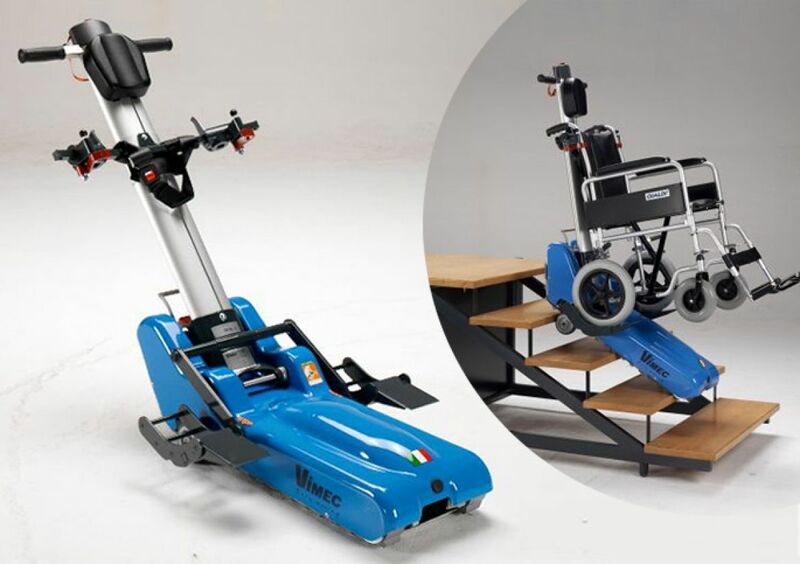 Multifunctional platform Version with platform for transporting all those wheelchairs and strollers that, because of their characteristics, cannot be anchored to the two preceding versions. 24 months from consignment date.